In modern board gaming, we tend to have a short memory and a long wishlist. Six of the top ten games on Board Game Geek were published after 2010. Kickstarter has us shelling out funds many months (sometimes years) before games are released, and by the time they land on our doorstep, we’ve already moved on to the next thing. In The Dusty Dragon–a monthly column on iSlaytheDragon–my goal is to reintroduce games from the past. Games that are at least five years old and are not in the Board Game Geek top 150. The goal of the column is to balance out the more immediate board game coverage on iSlaytheDragon by reminding us of some games that might have slipped through the cracks. The subject of the first article in this series is Kuhhandel (English edition: You’re Bluffing! ), a game I played for the first time in 2014. Despite being almost as old as I am (it first released in 1985), it was one of the most exciting games I played last year. Let me tell you all about this game of bidding, bluffing, and livestock. Kuhhandel is an auction/bluffing game for 3-5 players. Players compete through shrewd bids and bluffs to gain complete sets of animals. The player with the most points wins. 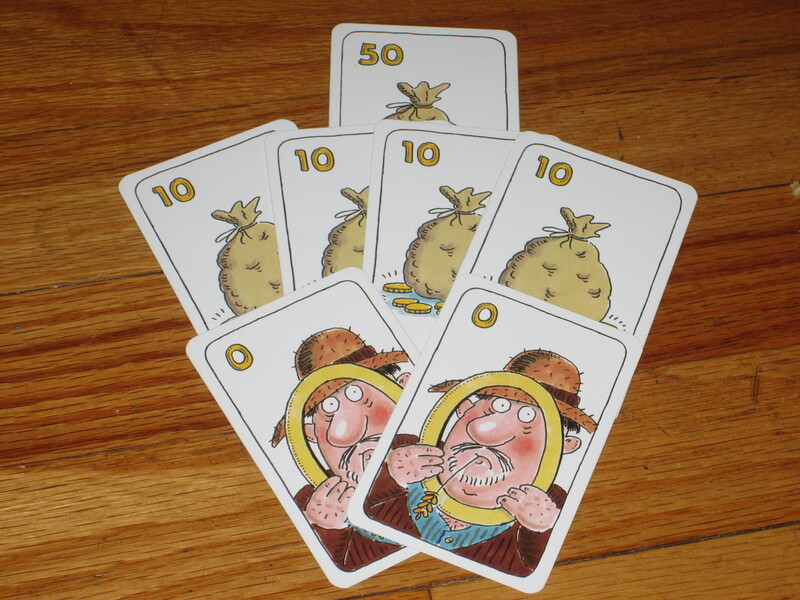 Players receive identical money cards at the start of the game. 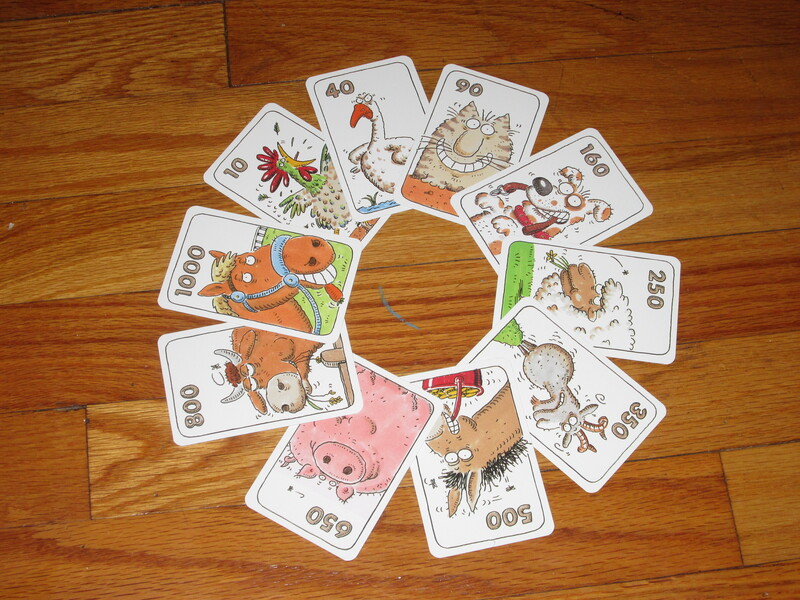 On a turn, players may either auction an animal from the top of the animal deck or perform a cattle trade. Each player begins with the same amount of money, shown here. The money in Kuhhandel is printed on cards and is meant to be kept secret. For auctions, the player turns up the top card. If it is a donkey with a bucket of money, each player receives more money (the sums earned increase over the course of the game). Then, all other players bid on the animal offered. Once the other players are finished bidding, the auctioning player may either accept the highest bid and give that player the animal or pay the winning bidder their bid and claim the animal. A player may, instead of auctioning an animal, cattle trade with another player. In order to cattle trade, a player must have at least one of the animal he or she wants to claim from another player. The player offers any amount of money face down to the other player. The other player may either accept the amount paid and give the player animals or make a counter offer. If the other player counter offers, the players take the offers into their hands–the higher offer gets the animals. 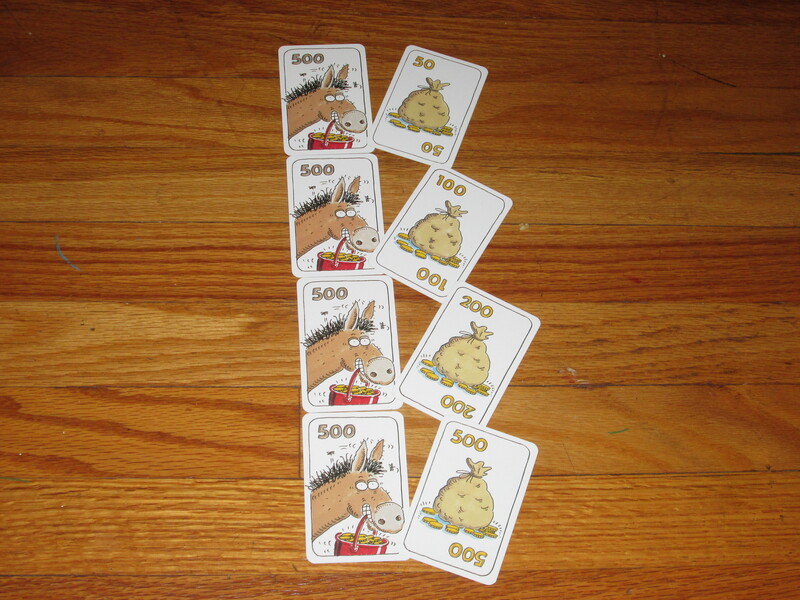 Whenever a donkey enters the game, each player gets a windfall, increasing in value as the game progresses. 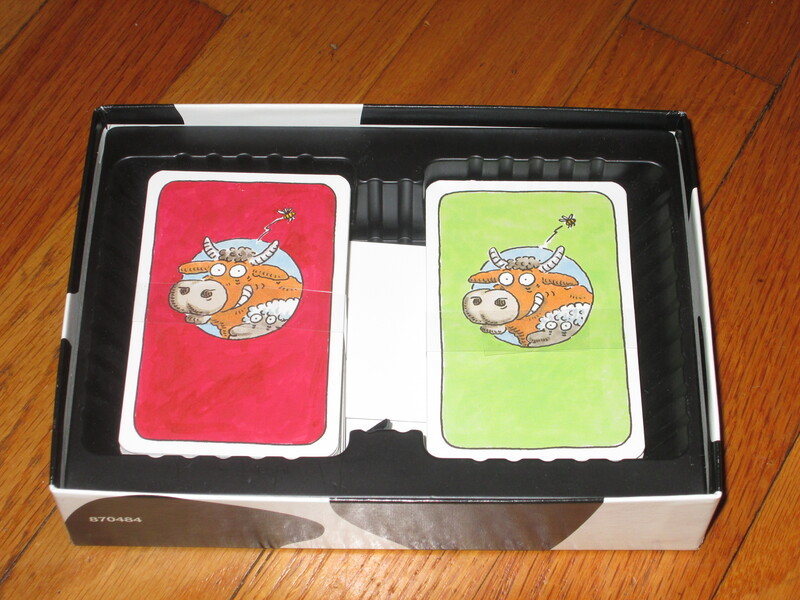 The game continues until all animals are in sets through auctions or cattle trades. 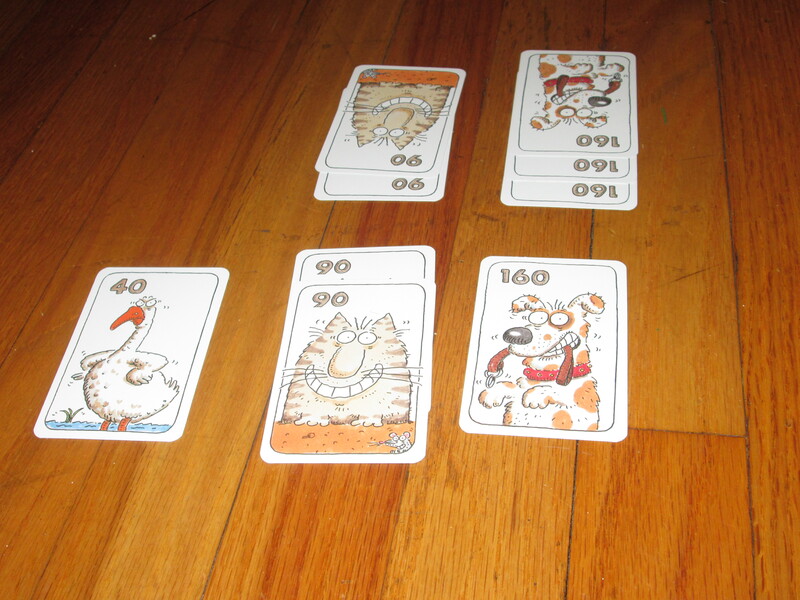 Players score the face value for their animals multiplied by the number of sets they have. The player with the most points wins. Animal Trader, or Animal Traitor? Kuhhandel is not a game I had heard much about until I received it as a sweetener in a math trade. The game artwork looks downright silly, and I had to track down an unofficial translation of the rules to learn how to play. I initially had a hard time finding opponents because given the choice between silly animal artwork or dour Euro faces, those I usually play games with would choose in favor of dour faces. But I forced them to play because I wanted to play, and this was clearly the right move. I’ve not introduced Kuhhandel to a group that did not dissolve into riotous laughter. Was ist das? 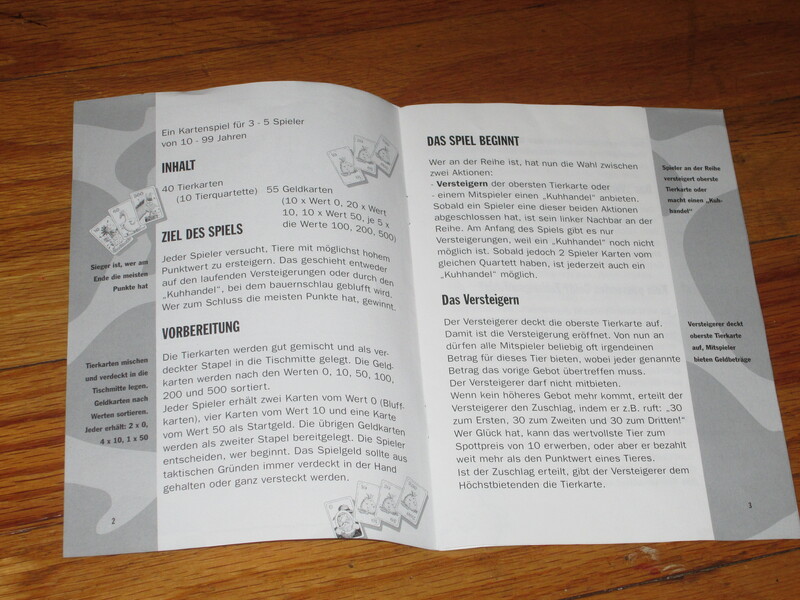 The German rulebook. Despite four years of high school German, I decided to hunt down an English translation. Why is Kuhhandel so much fun? Well, there are several contributing factors. The first is that just about everything in the game is secret. There is public information in the game–what animals are being auctioned off, who has what animals, which animal sets are completed–but all of the currency in the game is secret. Players start with the same amount of money, but that changes over the course of the game, and players are never required to reveal what they paid or offered, nor are they required to make change. You can generally tell from the sour faces when someone has been swindled, but amounts are verboten. This keeps the game tense and exciting. In addition to the secret money, money in the game is a closed system, meaning that money doesn’t leave the game (and new cash only enters the game when a donkey with a money bucket shows up). This means that the game has a long memory. Overpaying for an animal now may cost you in a cattle trade later, when the opponent can buy you out of your horses. Counter offering is a risky endeavor because if you guess the opponent’s cattle trade offer wrongly, you may still end up losing your animal and getting only a pittance to show for it. (Such was the case with my horses [the most valuable animal]one game–my wife so accurately guessed my offer that I gave her two horses for, essentially, $30.) Money is constantly changing hands, and you have to be careful whose hands it falls into lest they wreck your score in cattle trades. How could you not dissolve into laughter with this cast of characters? Of course, while trades are the heart of the game, players must be savvy about winning auctions as well. Players may only cattle trade for animals they have (basically, the affected players must have a stake in every cattle trade), so it behooves [!] you to win auctions, even though doing so will line the pockets of your opponents. Another of the excellent factors of Kuhhandel is just how much can be gamed in it. Players, obviously, may (and often do) bluff in their cattle trades, but they may also bluff in their auctions. The auctioneer gets money in exchange for animals, but the auctioneer may also buy out the winning bid to keep the animals. I have many times taken the high bid on purpose for animals I didn’t want just to take the auctioneer’s hard-earned cash. (It’s easier to secure animals at auction than in trade.) And you can bluff about the amount of money you have, bidding more than you can pay in the hopes that the auctioneer will pay you instead. Of course, both of these strategies can backfire, on the one hand locking you out of the reauction and on the other rendering you doubly stuck: paying top dollar for worthless animals and then being in a worse position when someone else comes to collect them in cattle trades. Balancing these possibilities, bluffing about what you really want, and negotiating through clever bids and offers is what the game is all about, and it’s thrilling whether you are on the winning or losing edge of Fortuna’s wheel. In this instance, these players could not trade ducks since only one player has one. A cattle trade for the cats would involve both cats (since they are split evenly), and a cattle trade for the dogs would be one dog against one dog (since they are split unevenly). Easy peasy. And I have, more often than not, been on the losing edge. Balancing auction wins with negotiated cattle trades is hard. You have to win auctions to have any points at all, but you also need to protect your assets. It’s a balance I’ve not mastered yet, but I’m willing to keep playing to try, just because the game is so much fun. Perhaps what I like most about Kuhhandel is how surprising the game is to play. I generally play conservatively, contemplating just how much that goat is worth and unwilling to pay a penny more. My mother, on the other hand, is a spendthrift, constantly throwing her cash around in what I smugly judge to be profligate ways. Yet more often than not, I have seen my mother win. In one case, I was so conservative that I ended the game with no animals, no points, and little money–yes, I played poorly–and my mother won handily without close challengers. Yet despite how I may grumble at a loss, it is thrilling to watch the way other players play, even when I lose. Are there life lessons to be learned here? Undoubtedly. But leave lessons for another time–I just enjoy the ride. Who knew that two decks of cards were so much fun? There are definitely some aspects of the game that people won’t like. There’s a tendency among new players to always counter offer when someone is making a cattle trade, and players wrongly valuing the animals in the game can quickly lead to being cash strapped. (It’s like misreading the board in Acquire, although Kuhhandel is more forgiving because more money is guaranteed to be doled out to each player.) Some cattle trades are more interesting than others, and because they are important, they can require some time for players to craft their offers. I’ve found even this aspect of the game exciting, but there will be some downtime (although not much: each player is surprisingly invested the whole way through). The game can have an anticlimactic finish: it’s often clear toward the end of the game who is going to win (since there can never be tiebreakers), yet the game isn’t over until all cattle trades are complete. And there is some kingmaking at the end as players desperate to save the last of their animals will throw their entire hand of money cards at another player if only to secure their gains, which puts that player in a better position relative to others. (I have purposely done this once, as retaliation for my sister stealing my horses.) These aspects of the game can be negative, and in some ways “date” the design, but none is a deal-breaker for me. The game offers such high highs that these comparatively modest lows do very little to offset the excitement of the early and middle game. Kuhhandel is currently out of print, but I’m guessing you can find copies fairly cheap in the aftermarket. Heck, my copy was thrown in with another game in a math trade. It’s a German edition, but the game is language independent, and the rules are easy to cobble together online (although, as I mentioned earlier, I always play with a variant to auction two animals at a time–this keeps the game moving and makes the game playable in an hour). Kuhhandel, despite being 30 years old, is still great, and it stands up very well against modern bluffing games. It’s playable with 3-5 players, probably best with 4-5, and it is an absolute blast to trade animals and swindle your friends and family. If you’ve never played this classic, it’s time to pony up. You won’t be disappointed.